Platelet Rich Plasma (PRP) and Stem Cell Therapy are being used for a variety of shoulder problems. 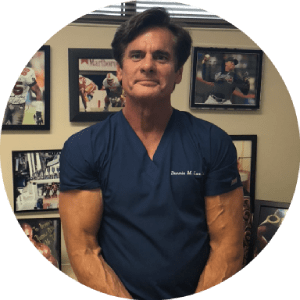 The rotator cuff is one of these shoulder problems that these regenerative therapies is used to treat by Dennis M. Lox, MD,. The rotator cuff is actually the tendinous insertion of 4 muscles muscles forming “a cuff” to protect the shoulder joint. One of these muscles the Supraspinatus, is often injured and may develop tendonosis, partial tears, or unfortunately sometimes a complete tear. The Supraspinatus muscle may be treated with Platelet Rich Plasma (PRP) or Stem Cell Therapy. These regenerative therapies heal and repair by harnessing the bodies own natural healing properties and allowing them to repair in areas that cannot achieve this affect do to injury or poor blood supply. Blood supply is vital providing repair cells to regenerate and heal damaged tissue. Dr. Lox has great experience in treating these problems non-surgically. Improperly healing rotator cuff problems may lead to shoulder joint arthritis. Successful treatment and healing can help prevent degenerative arthritis of the shoulder. Surgery can lead to more shoulder joint trauma. Trauma has been shown to accelerate arthritis. Platelet Rich Plasma (PRP) and Stem Cell Therapy may be effective techniques to treat shoulder pain that won’t go away.